Modern technology has made life much easier, and machines now do most of the work. It would be tough to go back to the technology of the 50’s and 60’s! Morals and family values have declined terribly. Even the family, itself, has declined since the 50’s and 60’s. Single parenting was rare back in those days. I’ve always sort of liked starfish, but starlight is great, too. It’s been a while since I listened to the radio for any length of time, so nothing is coming to mind. On second thought, I’ve heard an awful lot of Tim McGraw’s song, “Highway Don’t Care” on GAC tv. I don’t really care for home made ice cream, so it’s been years since I’ve had any. I don’t have a favorite flavor of home made ice cream, but anything chocolate is always my ‘go-to’. Lead by example, and give lots of encouragement and compliments, less criticism. Several weeks ago, during a storm, our power went out while I was cooking supper! We were without power for several hours, and it wasn’t much fun. The power crew had to return a few weeks later, to replace a fuse on the transformer, but I wasn’t home when they cut the power. Ed continues to feed the abandoned cats at his mom’s house each day, but there have been some more changes. “Trouble”, the cat, has left our son’s house, and moved back to Ed’s mom’s house. The feral mama cat has completely disappeared. We haven’t seen her in well over a week. One of the three gray kittens disappeared, as well. Another one of the kittens goes back and forth between our son’s house and Ed’s mom’s house. The third kitten? It’s made its way down to our house! It showed up here over the weekend, and has been here ever since. I guess it followed ‘the man with the can’ home! The kitten is still wild, and won’t let us touch it, but has apparently found a new home. I sure hope it turns out to be a male! Until last week, our home used to be nestled among lots of tall Georgia pine trees. The trees were a gift to me from my father-in-law, over twenty years ago. He decided to let his cow pasture (located next-door to our former house) grow up in volunteer pine trees, after I became upset while he was having his timber cut down. Little did any of us know that, one day, Ed and I would build a new home among those volunteer pines. When we built the first part of our new house, those volunteer pines were still relatively small. We liked living among the trees, it gave us the illusion of being in the mountains. 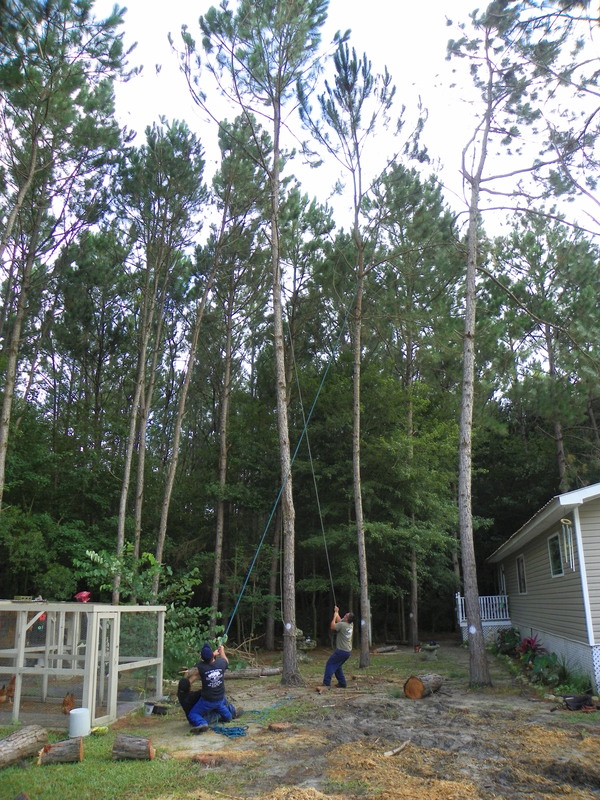 The years flew by, and before we knew it, many of our trees had become very tall (about 65 feet), and many had begun leaning in toward our home. A new reality began to set in. Whenever the wind blew hard, the tops of the pine trees would bang together, and it was quite scary! Limbs and pine straw were constantly falling on the ground, and pine tar was usually everywhere. 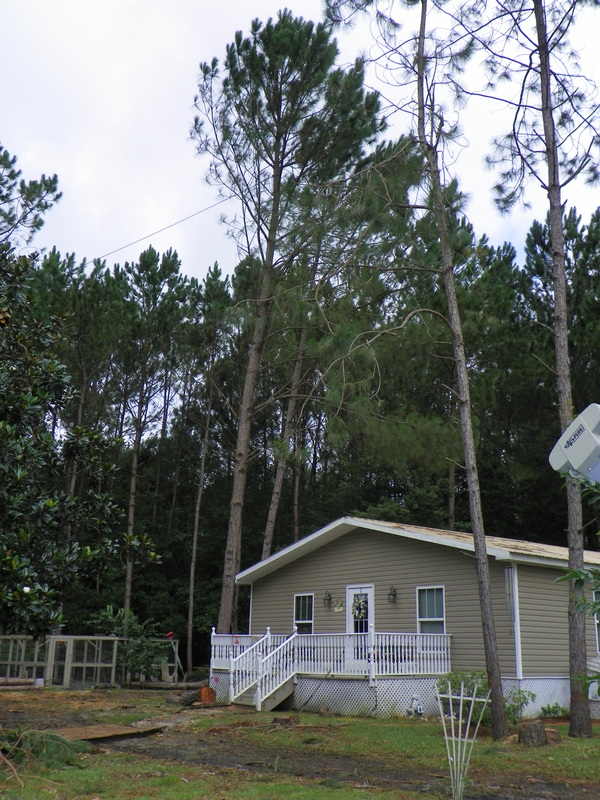 It didn’t help knowing that, several years ago, Ed’s aunt was actually struck and killed by a falling pine limb! 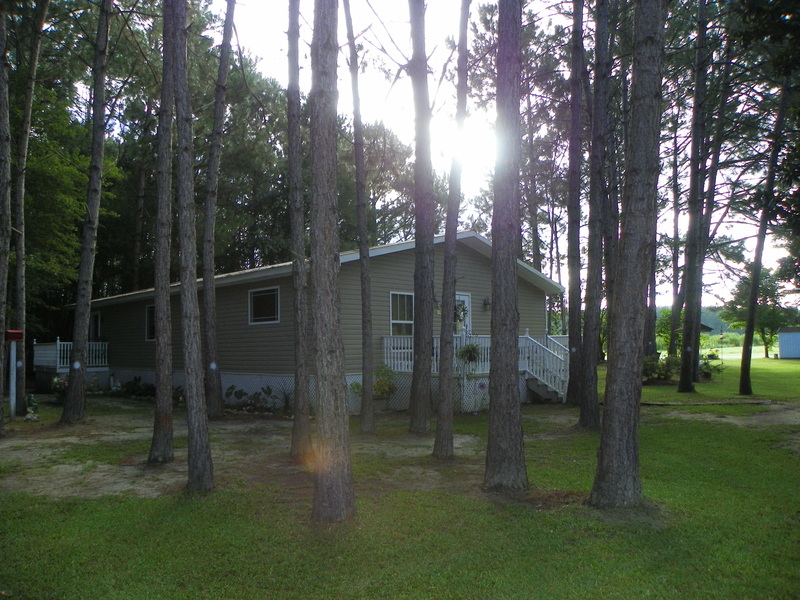 Last summer, we received quite a scare when, during a storm, three of those pines came tumbling down! All three falling trees brushed either our house or Ed’s storage house, but fortunately, the damage was minimal. Ed and I decided, as soon as we were financially able, most of the trees had to go! The day finally came. Early last week, Ed contacted a local tree trimmer that I’d read about in the weekly newspaper, when his wife was featured as ‘cook of the week’. Tim came out to the house the same day Ed called him. He gave us what we considered to be an excellent estimate, and we made a deal to have twenty-seven trees cut. Within two days (on Friday), Tim and his crew were at our house ready to begin cutting our trees. Rain had actually missed us for two days, so they decided to go for it! Little did any of us know that we’d get a flash flood over the weekend! All day, on Friday, I watched as the men began cutting our pine trees. We’d contracted to have twenty-seven pines cut, but by noon, on Saturday, the number to be cut had nearly doubled. Cutting some trees, exposed other diseased or faulty trees, and some trees were just in the way of getting other trees removed. Twenty-seven trees quickly turned into forty-something. I watched as most of our lawn soon became non-existent, thanks to the heavy machinery traveling back and forth over it. After the first day of cutting, I counted the rings on one of the larger stumps remaining in the yard. It had eighteen rings, one for each year of its life. One tree, located over beside our carport, was even larger, so I’m guessing it was even older. 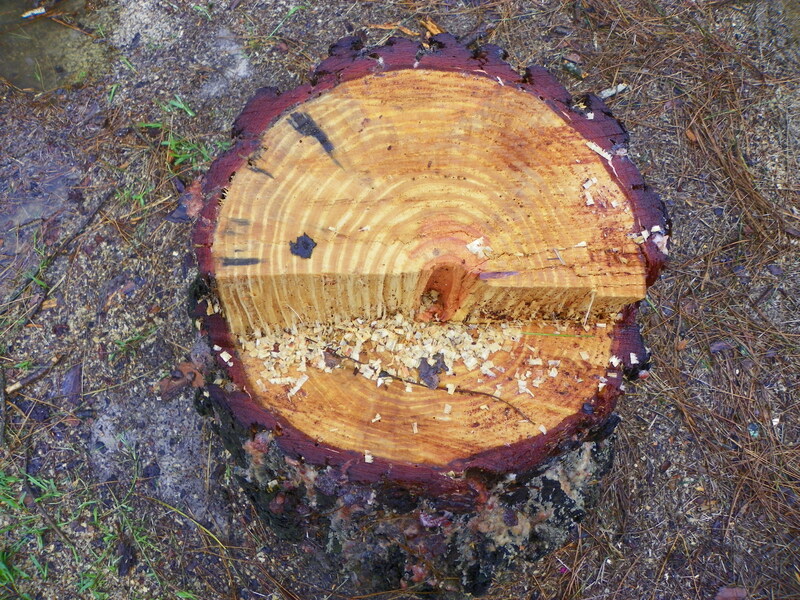 I didn’t get a chance to count its rings before the stump was ground up. It’s a brand new week, and I’d like to believe that it’s going to be a good one! The good news is, the tree trimmers are finished, so there won’t be any more destruction going on around our house–at least I sure hope not! The bad news is, I’m starting out the week with another dentist appointment 😦 because I’m having more dental problems! I just don’t understand what’s going on with my teeth. My latest mishap happened while I was eating a pork chop! 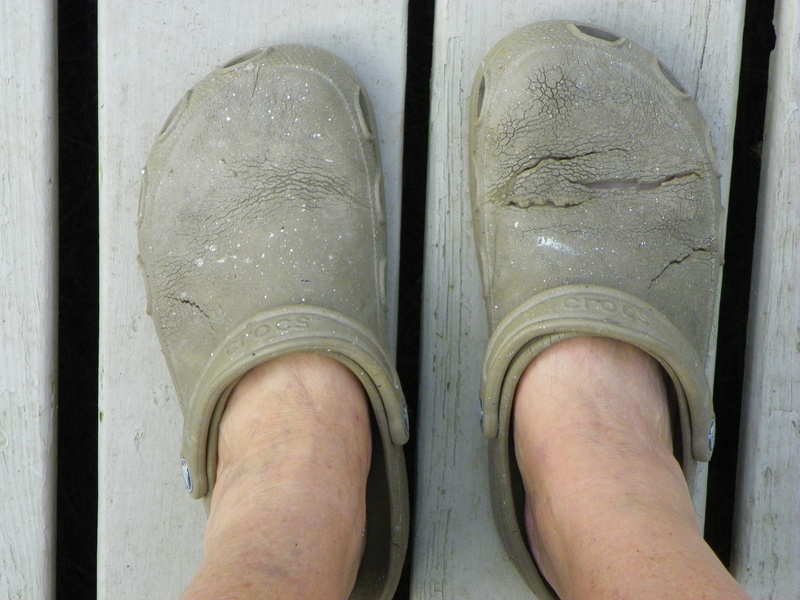 My favorite pair of shoes was my very first pair of Crocs. I bought them back in 2006, and I wore them completely out! Sadly, I retired them to the trash can, just last week. However, being the blogger that I am, I had to photograph them before I tossed them… I have other Crocs, but my first pair will always be my favorite! Yes, I sure do. It doesn’t take much to make me blush. Crying or unruly children in restaurants or stores! No, I won’t be celebrating, but I do love Lasagna! My favorite lasagna is made from a recipe that originally belonged to our former pastor’s wife, and it’s delicious. 5. When was the last time you saw a snake, and where was it? The last time I posted, I was feeling very frustrated and was looking for a ‘silver lining’ to the perpetual cloud that has been hanging over our house! I’m happy to report that I think things are beginning to look up, somewhat :). We’ve actually had a three-day reprieve from daily rain showers, and all trees have now been cleared away. We won’t talk about how bad the yard looks, or the fact that our riding lawn mower is currently broken, thanks to Ed running over the protective netting on our blueberry bush! We also won’t talk about how my cd player and my photo printer both died last week, or how Ed lost his cell phone the week before that! After an exasperating day on Wednesday, the tree trimmers took Thursday and Friday off. You may recall, on Wednesday, they busted our water line, cut the Dish Network cable, and bogged the Bobcat down in our yard. The trimmers returned bright and early, on Saturday, ready to finish the job. The day went smoothly–right up until they ran over Ed’s pitch fork and flattened the tire on their Bobcat! Ed’s pitch fork didn’t fare too well either! The trimmers worked non-stop, on Saturday, not even breaking for lunch. I tell you, these men were determined to finish with us on Saturday! Did I mention that it also started to rain again during the course of the day and their Bobcat almost bogged down again? I don’t know who was more relieved when the job was finished, us or the workers! Ed asked Tim, the boss, if he’d be willing to come back if we needed him again. He said, “Yes, as long as it’s dry!” I joked and said he’d probably ignore our call when he saw our number come up on his phone! Unfortunately, we had to call the Dish Network people again, on Friday, because the technician neglected to bury the spliced cable back in the ground on Wednesday! He merely spliced and taped the cable, then left, but we didn’t notice the cable still laying on top of the ground until Thursday, because our yard is a bit of a mess. Another technician came out on Saturday and buried the cable for us. As the Dish Network technician was leaving, on Saturday, he stopped just down the lane from our house and killed a rattlesnake as it was crossing the road! This was quite interesting, because just two hours before, I ran over (with my car) another rattlesnake crossing the road–on that same little dirt lane! Two rattlesnakes in one day is scary! I couldn’t help but wonder if they were running away from the tree trimmers! Speaking of snakes, our daughter nearly stepped on one last week, because it was stretched out in front of her door! Fortunately, her snake was a non-poisonous one, but it nearly gave her heart failure! Around here, the summer of 2013 seems to be the year of the snake. There have been seven sightings/killings, in and around our yard this summer! That’s it for me today. I must get going to meet with my dentist–again. This will make visit number four, since the end of May! Ouch, that hurts–in more ways than one. I’m trying to think positive, so thank goodness for dental insurance, it helps with the pain. I’m trying to smile and be positive, but lately, it’s becoming very hard! I can’t help but feel as if a perpetual cloud has been hanging over our ‘neck of the woods’–literally and figuratively speaking! Like so many others around us, we’ve been receiving daily rain showers for well over a month now. To say our ground is thoroughly saturated would be an understatement! 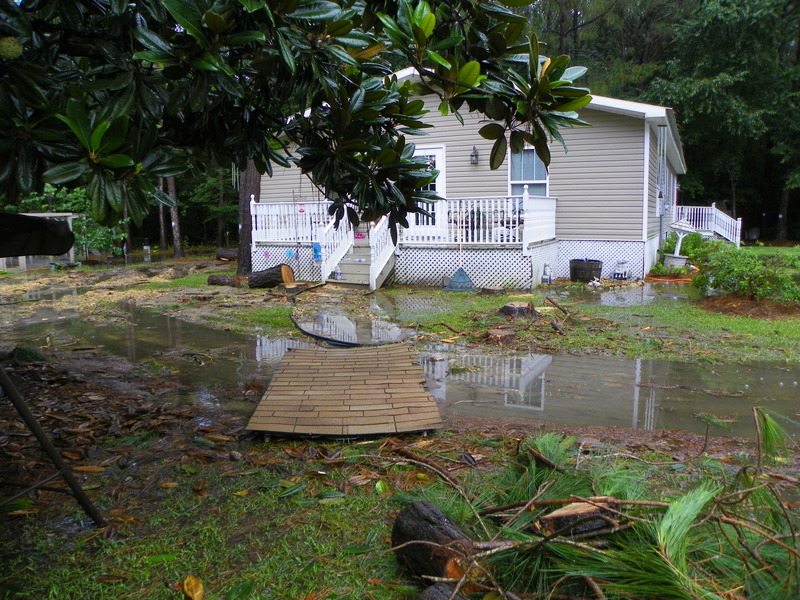 To say we are living in a swamp would accurately describe our current living conditions. The ground is so wet it has begun to smell like a swamp, and the mosquitoes are so thick outside, it feels like a swamp, too. Insect repellent has become my new perfume! Yesterday was a difficult day for our tree trimmers. As they continued their work at the far end of our house, they discovered the land is much wetter there than they first realized. Getting daily showers of rain hasn’t helped either! Among yesterday’s many mishaps with the tree trimmers, was a broken water line and a severed cable to our Dish Network satellite! To say it was a bad day for all of us would be another understatement! Both incidents happened while the men were attempting to grind a multitude of stumps on the front side of our house. Fortunately, within a few hours, both lines had been repaired, but there was one final mishap at the end of the day! At my request, the men had ventured up near the chicken pen to remove a large pile of limbs and debris near our daughter’s yard, before calling it a day. While in that area, they decided to grind a few of the stumps near the chicken pen. Within just a few minutes, the Bobcat and stump grinder bogged down! It took the men well-over an hour to get the machine out, and by the end of the day, we all had a headache! We’re not sure when the weather is going to dry off enough for the workers to get back in and finish the cleanup, so we’re playing a ‘waiting game’ with the rain. The workers can’t collect all of their pay until the job is finished, and our lives can’t get back to normal until they finish the job. I think I can safely say, everyone is looking for a silver lining in the cloud that continues to hang over our ‘neck of the woods’. 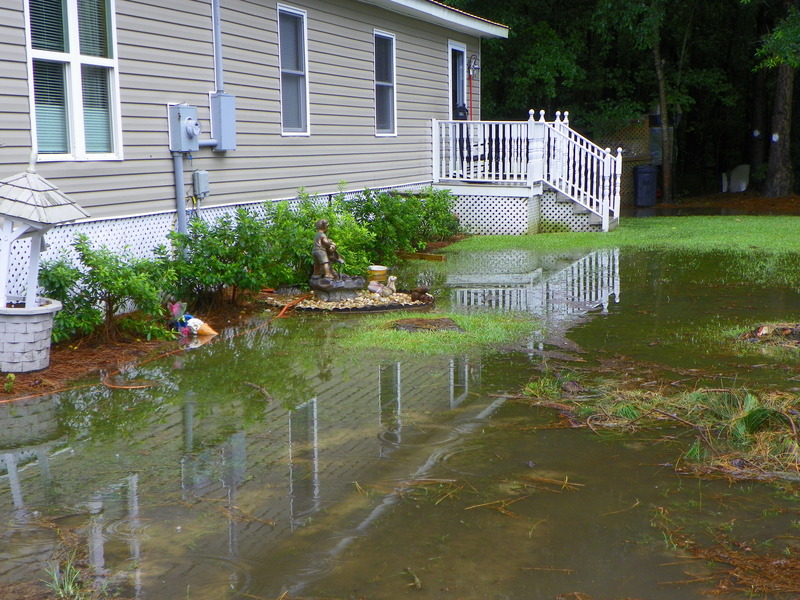 It’s still very wet here, so I’m wading into everything these days–even the Hodgepodge. I’m thankful for this brief distraction from the stresses and issues of my daily life, especially this week! Thank you, Joyce, for providing another set of great questions. 1. July 24th is Amelia Earhart Day. Earhart was the first female to fly solo across the Atlantic Ocean. What’s something you’ve recently accomplished solo? Canning enough home-grown vegetables to last the entire winter. In fairness, Ed helped a little, but most of the task fell onto my shoulders. 2. What’s one product you use that never ever fails? My hairspray. In spite of our somewhat ‘damp’ (what an understatement!) weather, it continues to hold my hair into place. Yes, I’ve found my place in the world. It’s staying home and enjoying being a wife, mother, and grandmother. I’m content. The worst movie I ever paid to see was Vanilla Sky, starring Tom Cruise. What a stupid movie! 5. What’s the last fun thing you did? A few weeks ago, Ed and I met my brother and sister-in-law at St. Simon’s Island for the day. We had a great time, and hope to do it again soon! 6. The month of July is named for Roman Emperor Julius Caesar…ever been to Rome? What’s your favorite Italian dish? Nope, I’ve never been to Rome–not even Rome, Georgia! My favorite Italian dish is pizza. 7. What is one piece of advice you’d offer new mom Kate Middleton? Spend every moment you can with your baby, because babies grow up quickly! We’re now entering day four of the tree cutting! 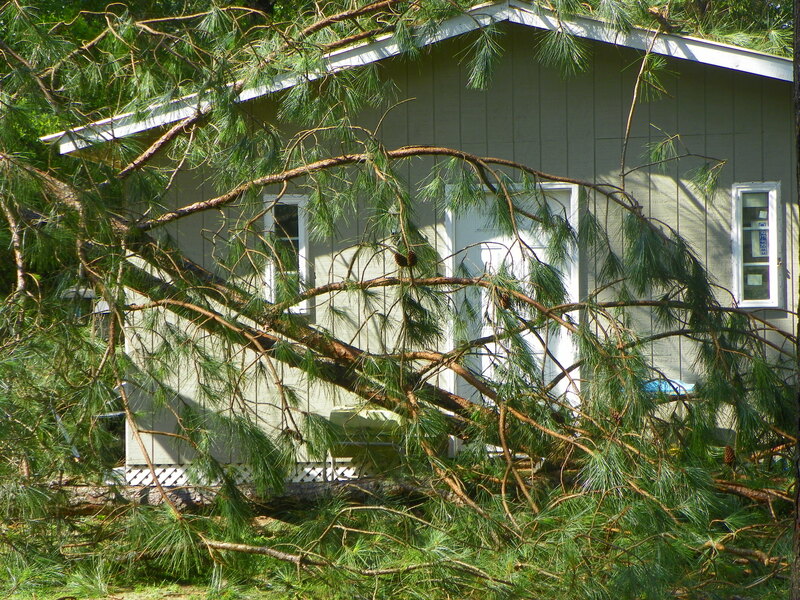 The wind really wreaked havoc with the tree trimmers yesterday. Two trees didn’t fall exactly where they were supposed to, thanks to an unexpected breeze, but thankfully, the damage done was insignificant, and nobody got hurt. I thought I was going to have heart failure though! Four large pines still have to be cut, all within a few feet of the back of our house. Also, the ground has become so wet, the Bobcat, a machine used to remove the cut-down trees, is tearing up our yard something awful. What a mess to deal with! There’s just no easy way out. 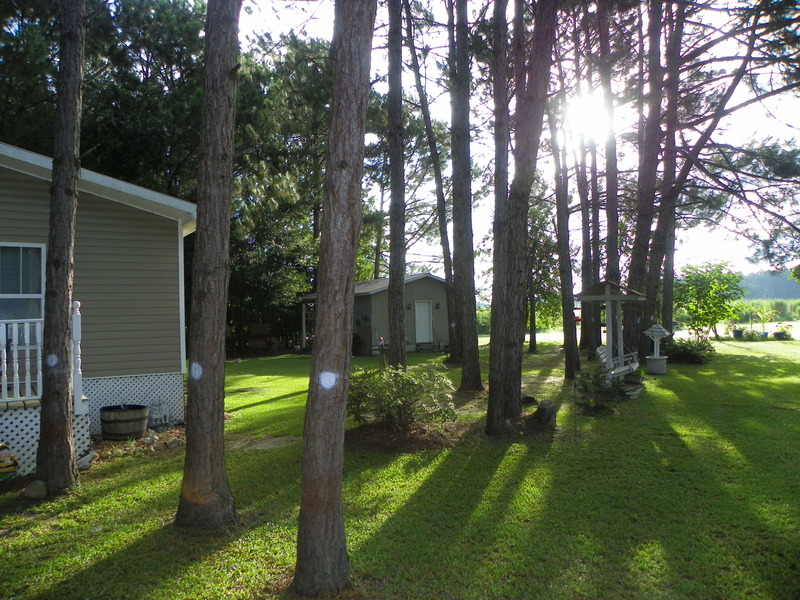 Just look at how those trees were leaning in toward our house! I’m happy to say, all of these have been safely taken down. 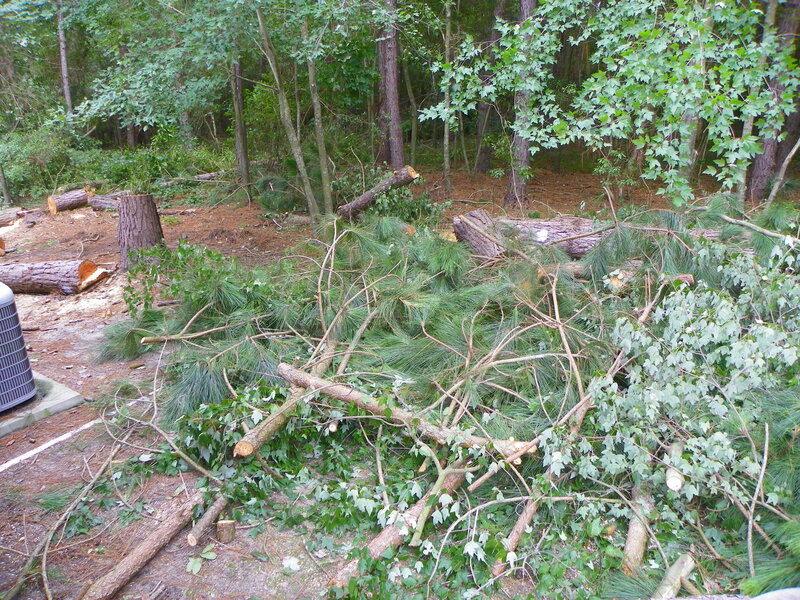 However, lots of cut trees are still waiting to be removed with the Bobcat–and we had more rain last night. Did I mention that there’s rain in our forecast for the rest of the week? Sigh. There are few things that annoy me more than having appointments, with the exception of hair appointments. Unfortunately, last week, Ed and I seemed to have more than our fair share of appointments. On Tuesday, I had an appointment to get my hair cut and colored. No problem there, but unfortunately, I’ve been suffering with a recurring toothache. Even though I was just at the dentist last month, I woke up with a throbbing toothache on Tuesday morning. When I called my dentist’s office, the only appointment they had for Tuesday conflicted with my hair appointment. What’s a woman to do? I decided to skip getting color, and only get my hair cut. By doing that, I could make the dentist appointment, too. After having the toothache for two months, so I was more than ready to see the dentist again! Last month, when I’d complained of this same tooth hurting, along with the one above it, the dentist examined the tooth, and assured me nothing was wrong with it. He said the broken tooth above it was causing the bottom one to throb. Sure enough, after having the top tooth fixed, the bottom tooth felt better–for a while. Then it began to throb again! Tuesday got even more interesting, after I got to the dentist’s office. While sitting in the exam chair, waiting for the dentist, suddenly I heard my mother-in-law’s voice coming through the wall of the exam room! It turned out that she was at the dentist for a toothache, as well. I was only able to catch a glimpse of her as she was leaving–after having the last tooth in her mouth pulled! (The director of the assisted living facility had accompanied my MIL to the dentist.) Lucky lady, she’ll never have the toothache again–and will be getting another set of dentures very soon! On Tuesday’s visit, my dentist found a crack in between two of my bottom teeth. He warned that I may end up having to get a root canal and a crown, but said he’d see what he could do. Fortunately, the crack wasn’t deep, and the dentist was able to fix it. Thank goodness, I was able to dodge the bullet, once more. I just wish I knew why my teeth are falling apart! It also happened, on Tuesday, that Ed had an appointment, too. His appointment was with an ophthalmologist, to make arrangements to have cataract surgery. Ed hates going to any kind of doctor, so to say he was less than thrilled about his appointment, would be a HUGE UNDERSTATEMENT! Ed came home, with his eyes dilated–and an appointment for cataract surgery, next month! He can hardly wait…NOT! Believe it or not, I had a second dentist appointment on Friday! It was a pre-scheduled appointment for cleaning and x-rays, but I was still having tooth problems, as well. I’d discovered, once my mouth wasn’t numb anymore, that my new filling was a bit too high, and kept hitting the tooth above it whenever I tried to close my mouth! Fortunately, on Friday, the dentist was able to drill the filling down, just a bit. No shots, and no pain! Now I can close my mouth, and I no longer have the toothache. Life is good again. Thank goodness, there are no more appointments, of any kind, scheduled for the rest of this month! 1. Picture postcards were first printed back in the mid-1800’s and deltiology is the official name for postcard collecting. When did you last send a postcard? Receive one? Do you save postcards sent to you? Do you collect and/or send postcards when you travel? It’s been years since I sent or received a post card! Once upon a time, I used to collect post cards while on vacation, but it’s been years since I’ve done that, too. I still enjoy looking on the post card racks at souvenir shops though! One of my favorite places to visit, while on vacation, used to be the candy shops. I love chocolate fudge! Sadly, fudge is not on my diet anymore. Sigh. I need to find a new favorite place to visit–and a new favorite treat! No, not at all! Unfortunately, my face is quite transparent. Yes, we still get phone books delivered every year. In fact, we get several phone books every year! Ed and I are still a bit old-fashioned, and most of the time we still depend on our phone book–and our land line, at least for now. I’d rather be last, almost always. I hate being first for anything! In May, I went to our local recreational park to watch our grandson play t-ball. Does that count? Other than that, I guess the last time I went to a park was in 2010, while visiting Helen, GA. Rescuing so many animals from our local animal shelter, but I don’t regret it. My heart was in the right place, I just didn’t use my head! So many hungry mouths to feed–and pet food has become ridiculously expensive over the past nine years! During 2004/2005, I adopted 21 cats, 5 dogs, a rabbit, and a parakeet–and paid to have every cat and dog spayed and neutered! It’s now nine years later, and we’re still buying food for 12 cats, 2 dogs, and the parakeet! That’s not counting the four cats that we feed at my MIL’s house! I’m praying that today will be a dry and sunny day! 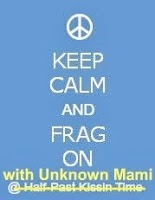 We haven’t had one of those in QUITE A WHILE! (Yesterday we stayed dry until about 4:30) I’m also praying that these tall pine trees, especially those leaning in toward our house, do not decide to fall over. The ground is so saturated, any kind of stiff winds could be disastrous for us. We’re also buying our drinking water, and I can’t wash clothes either. Fun times! Lately, life with “the girls” has been anything but dull! In mid-June, our six Rhode Island Red’s came down with a mysterious illness that claimed the life of one, and left the remaining five fighting for their lives. I consulted “Google”, while husband, Ed, visited our local feed & seed store, in search of remedies for our poor hens. After a week of medication, plus lots of TLC, the girls appeared to finally be on the road to recovery. Then a new problem began to present itself! The new problem began when I started noticing a few loose feathers in the chicken coop. My first thought was, Oh, it’s molting time! Each day I’d notice a few more lost feathers, but I then began noticing that all of the feathers seemed to be coming from only one hen! Before I knew it, this particular hen was missing her tail feathers, as well as most of the feathers underneath her. Uh oh! I knew we had a problem! Once again, I turned to trusty “Google” for answers. After reading a bit, then observing the hens scratching themselves more than usual, I determined that my girls had contracted a case of parasites! I had no idea what kind of parasite the hens had, but it really didn’t matter since treatment is the same for lice and mites. I began by trying to ‘dust’ the hens. You’ll notice I said “trying”. Normally, “the girls” are very friendly, and I’ve never had any problems sprinkling dust on them in the past, for preventative maintenance. However, two weeks of illness had taken its toll on them, and they were no longer friendly and trusting. 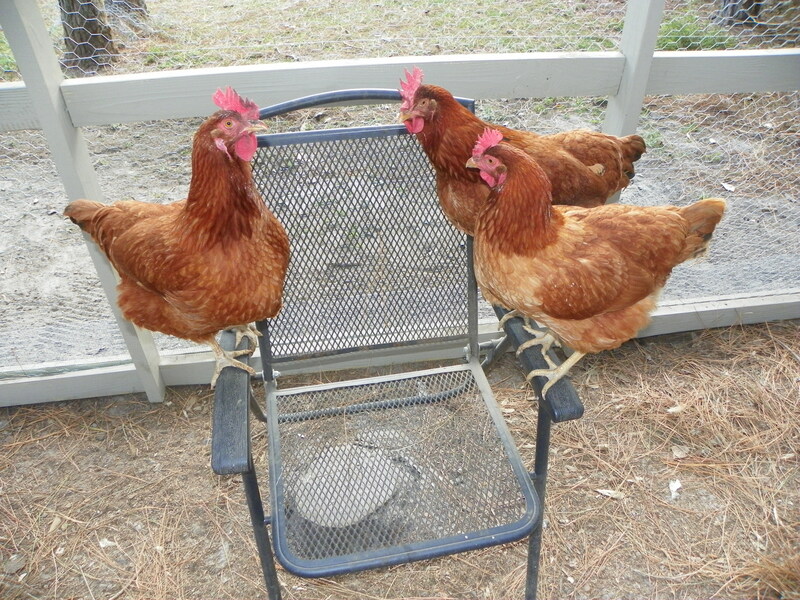 I dusted them the best I could, which was basically throwing dust toward them, then I dusted their hen-house. I watched and waited a couple of days, but noticed the hens continued to scratch, and feathers were still falling out. Apparently, it was time for Plan B. I sprayed the hen-house with insect spray, dusted the floor, nests, and perches with powder, then I waited until nightfall. As soon as it was dark outside, Ed and I headed for the hen-house. Ed picked up the hens, one at a time, and held them, while I liberally dusted each one with insect power. “The girls” definitely didn’t seem to enjoy being held and dusted, and some even put up quite a fight! Again, I watched and waited. Almost immediately, feathers stopped falling! Over the course of a couple of days, their scratching subsided. Mission accomplished! Now we just have to wait for “Sister” to regrow all of her missing feathers! Fortunately, the loss of feathers hasn’t seemed to bother her one bit, and thankfully, the others haven’t seemed to notice her bare spots! I blame the infestation of parasites on a couple of things. First of all, the conditions here are VERY WET, and have been for weeks. There hasn’t been a dry spot in their coop for ages. Chickens need to be able to dust themselves to control parasites. It’s hard to dust your feathers in MUD. I also believe our hens’ previous illness may have been a contributing factor. I know from experience, a critter’s immune system plays a part in how well their bodies deal with parasites. All’s well that ends well. “The girls” are back to their normal, happy selves–for now. Their appetites are nearly back to normal, and they are continuing to gain back the weight they lost while sick. They’re beginning to get friendly again. Egg production has continued, and egg size is getting back to normal. Their egg count? As of yesterday, 1404. It’s been exactly a year since they first began laying eggs. To be continued… I’m sure!